The exhibit is posted as a Facebook event: http://on.fb.me/1T6XHsn. 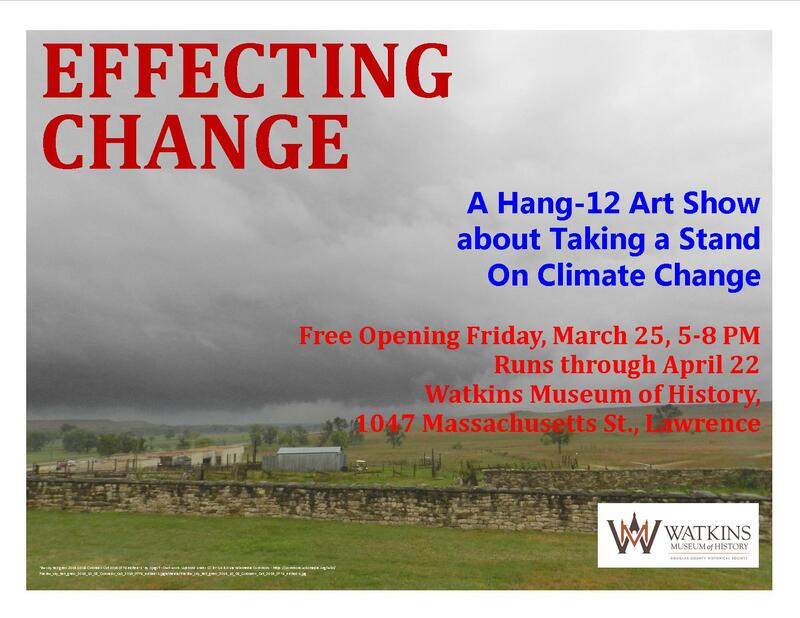 LAWRENCE — “Heating Up: Artists Respond to Climate Change” is an art exhibit and month-long series of cultural and educational events scheduled for March and April in Lawrence, Kansas. The project brings together dozens of local and regional artists, poets, educators and performers working on climate change. A panel discussion in April includes a combination of nationally active and prominent local voices. The exhibit “Heating up: Artists Respond to Climate Change,” opens on Final Friday, March 25, 2016, 5 – 10pm, at the Lawrence Percolator located in the alley east of New Hampshire St. between 9th St. and 10th St., behind the Lawrence Arts Center. The opening will feature three brief performances. At 7 and 9 pm, Robert Baker will read poetry by Langston Hughes and the band Ovaries-eez will perform. At 8 pm, local poets Dennis Etzel, Sandy Hazlett, Denise Low, Topher Enneking, Nancy Hubble, and Mary Wharff will read from their poetry, and Doug Hitt will briefly speak about his co-authored book A Kansas Bestiary. The exhibit runs March 25 – April 23 and is open Saturdays and Sundays, noon – 5pm. “We hope that the exhibit bolsters a community conversation about climate change and what we can do about it,” said committee co-chair Lora Jost. The exhibit includes the work of 42 local and regional artists with diverse viewpoints, some working in teams. The exhibit includes art by professionals and non-professionals, among them professors and students alike. “We wanted to exhibit the work of artists who are already working on climate change as well as to activate others to engage climate change as a new theme in their work,” said committee co-chair Sara Taliaferro. Art in the exhibit includes paintings, prints, drawings, an artist book, sculptures, and installations. Some of the art pieces concern the roots of climate change and the effects of fossil fuel consumption on the weather, animals, and people. Some of the art pieces convey deep despair. One artist’s work is a metaphor for creativity born from crisis. Additional art pieces offer hope, visualizing ways to work together toward solutions. Laura Ramberg’s ceramic cloud vessels evoke sharing food and other resources as a way to reduce the need and greed arising from our reliance on fossil fuels. A team of artists (KU Professor Matthew Burke and then students Samuel Balbuena, Cameron Pratte, Vi Stenzel, and Cortney Wise) contributed a functional beehive that, once launched, offers a home for the dwindling honeybee population. Marin Abell’s whimsical 9-foot long flat-bottomed trolling motorboat, complete with serpent heads, is made with Eurasian Milfoil (an invasive aquatic plant that threatens lakes) and runs on distilled Milfoil ethanol. Exhibiting artists include: Marin Abell, Angie Babbit, Rena Detrixhe, Jill Ensley, Neil Goss, Lisa Grossman, Eleanor Heimbaugh, Nancy Hubble, Lora Jost, Dave Loewenstein, Justin Marable, Nancy Marshall, Kaylyn Munro, Molly Murphy, Laura Ramberg, Hirsuta Pilosa, Michelle Rogne, Kent Smith, Damia Smith, Sara Taliaferro, Garret Tufte, David Titterington, Nicholas Ward, Ethan Candyfire, Georgia Kennidee Rikie Boyer, Kyuss Hala, Kayla Kent, Cleta LaBrie, Lori Hasselman, Alyx Stephenson, Geraldine Emily Walsey, Katie Manuelito, and KT Walsh. 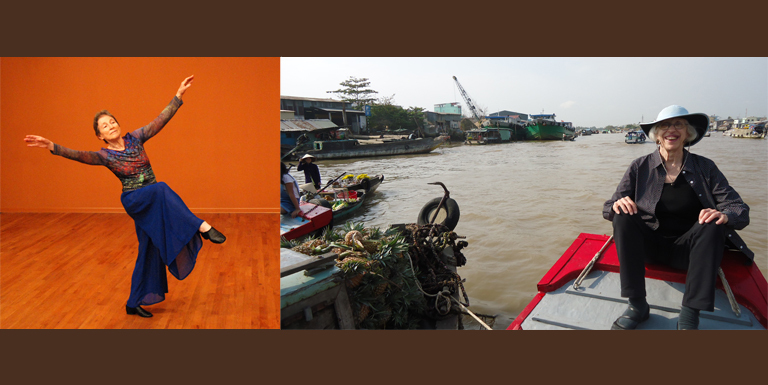 Three teams of the following artists have created collaborative works: Samuel Balbuena, Matthew Burke, Cameron Pratte, Vi Stenzel, and Cortney Wise; Amanda Monaghan and Pablo Cerca; and Amanda Maciuba, Tim O’brien and Mary Wharff. 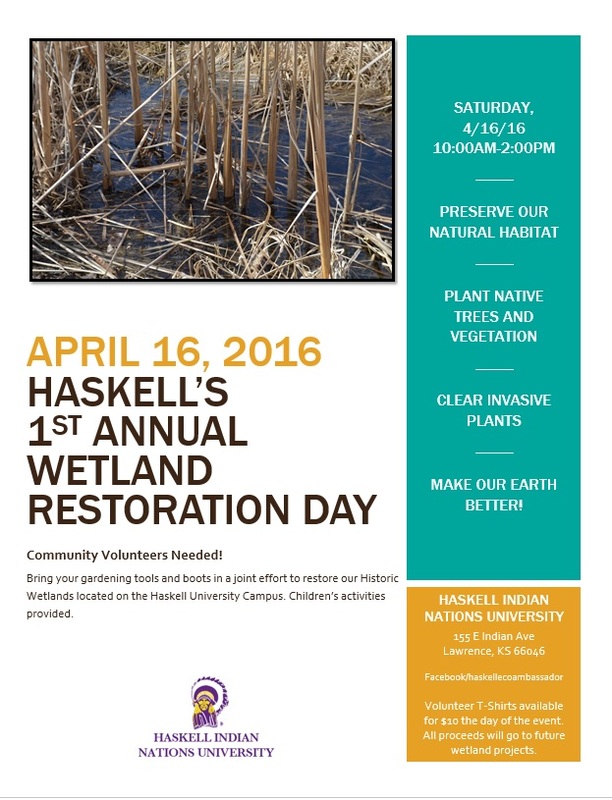 The “Heating Up” project grew out of a local event in 2014 that brought together these sponsoring groups with leaders from the Haskell Indian Nations University community, on a march and art event against climate change. The success of the 2014 event helped inspire the current collaboration.. (See link for 2014 collaboration http://usdac.us/news-long/2014/10/16/the-peoples-climate-march-makerspeaker-party-lawrence-ks).